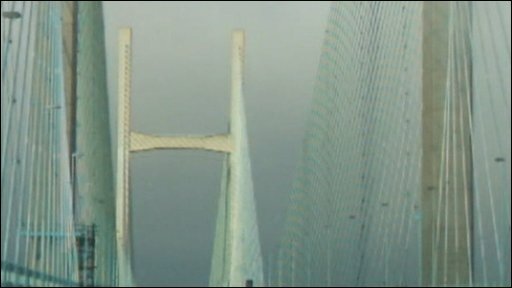 The second Severn crossing has re-opened, four hours after being closed because of falling ice. It first reopened eastbound to motorists travelling out of south Wales into south west England, clearing six mile tail-backs on the M4. 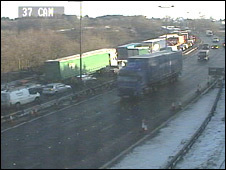 The westbound carriageway reopened at 1445 GMT, after queuing as far back as the M5 interchange at Almondsbury. The old Severn Bridge was also closed eastbound for a couple of hours but now has one lane open in each direction. Both motorway crossings were shut in similar circumstances during wintry weather last February, when car windscreens were smashed. 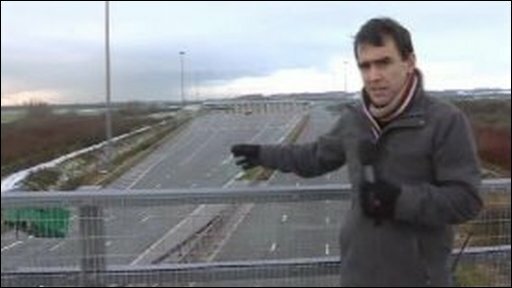 Again, falling ice from overhead gantries on the motorways and the danger to motorists was the reason for the closures. Queues soon formed around Newport with delays of an hour reported. Gwent Police had closed the M4 carriageway at the Coldra roundabout, where vehicles were being diverted, causing queues through the Brynglas tunnels. 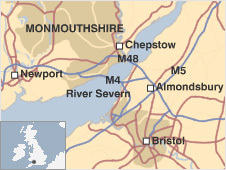 The second crossing carries the M4 between south Wales and Avon, while the M48 goes over the old Severn bridge. Jim Clune, general manager of Severn River Crossing, said for the bridges to be affected for the second time in a year was very unusual. "We are aware of what's happening and we're in touch with the Highways Agency regional traffic control centre in Avonmouth," he said earlier. "Health and safety is paramount and we're hoping that the bridges get back to normal as quickly as possible." An Assembly Government spokesperson said it was "very disappointing" that the second Severn crossing had been closed but the safety of drivers had to be "the first priority". "The decision by the UK Highways Agency to close the bridge is likely to cause inconvenience to drivers and we hope the issue will be resolved as quickly as possible," said the spokesperson. "We have asked the UK Highways Agency to meet with the bridge owners as soon as possible to find out why this problem has apparently occurred again." The bad weather also led to more than 80 school closures, mainly in south Wales, while motorists have been urged to take care on roads. Temperatures plummeted below zero, leading to warnings of ice on roads. There were two crashes on the M4, one involving four vehicles eastbound near Margam, which closed one lane, and earlier westbound between J44-45. A car was reported to have hit the central reservation between junctions 44 at Llansamlet and 45 at Ynysforgan, at 06.40 GMT. Then later, four vehicles were involved in a collision, which initially closed two lanes of the motorway eastbound between junction 38 near Margam and junction 37 at Pyle. Bus firm First Cymru said services in Neath were expected to run normally, apart from the 158 service which is not serving Caewathan due to icy road conditions. In the Swansea Valley, services were missing out Godrergraig and Alltwen, while in Bridgend county services were running to Nantymoel but not via Wyndham and so were turning at Pricetown Clock. Motorists in the Vale of Glamorgan are being urged to take extra care when travelling on a section of the A48 in Cowbridge. The council's highways department is warning of a particularly bad stretch of black ice on the town's bypass. One lane of the A48 westbound at Nantycaws Hill, Carmarthenshire, is closed due to accident between the B4310 (and A484/A40. Drivers are advised to approach with care. Horse racing at Bangor-on-Dee has already been abandoned due to a frozen track after an inspection on Monday.